The sulfur-containing flue gases are typical pollutants which play a major role in the damage of lakes and forests by acid rain fallout. In the worldwide view, there are several industrial emission sources of sulfur dioxide containing flue gases: fossil fueled power plants, sintering processes in steel mills, coking industry, catalytic cracking processes in oil refineries, and coal-powered boilers, etc. Among all these industries, fossil fueled power plants account for the most sulfur dioxide emission. The removal of SO2 from exhausted flue gases are called flue gas desulfurization(FGD). 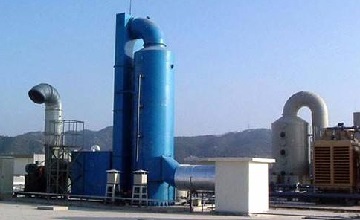 A typical flue gas desulfurization system. A set of technologies have already been developed for FGD, one of the most prevalent is wet scrubbing process, in which a slurry of alkaline sorbent, usually limestone or lime, or seawater is used to scrub the flue gases generated from fossil fuel burning. The conditions in the outlet ductwork and stacks of the FGD system is highly aggressive and quite corrosive. Titanium has demonstrated its exceptional corrosion resistance and most effective life cycle cost in the circumstances. Generally, unalloyed titanium grade 2 sheets manufactured to ASTM B265/ ASME SB-265 are widely applied as the lining of stacks and chimneys. Next: Why Titanium Tubes Are So Popular in Heat Exchangers?